Because these days, the package is usually light, and covered in FRAGILE notices. And when the brown paper wrappings are torn off, and the packing paper lifted away, there is a smaller, beautifully crafted, and carefully positioned box inside. This box, when lifted to the nose, exudes heavenly aromas, and my salivary glands respond like Pavlov’s dogs. We have been the happy recipients of artisan chocolates from all over the world, crafted by some of the graduates of Ecole Chocolat, who have now gone on to create their own businesses, featuring original signature chocolates. My partner is photographing them for part of the website, and the boys and I are delighted to gobble up the “models” after their turn in front of the camera. This past weekend, we sampled the chocolates of three artisans. I was not familiar with any of these chocolatiers, before now, but it has been very interesting getting to know them through their creations. The chocolate personalities are so unique, I find myself wondering what the story is, behind each one. From the lavender bud topped Earl Grey bon bons, to the deep blue of the cornflower atop the Jasmine, the contents of this box are indeed, vey pretty. I think it is especially cruel that I am forced (by my unreasonable partner) to put the lid back on the box, and put these treasures safely in a heavy duty freezer bag, with all the air knocked out, and place them in the back of the refrigerator, to ensure they will not degrade…. Humph! The BEST way to ensure they will not degrade it to EAT them, right away! 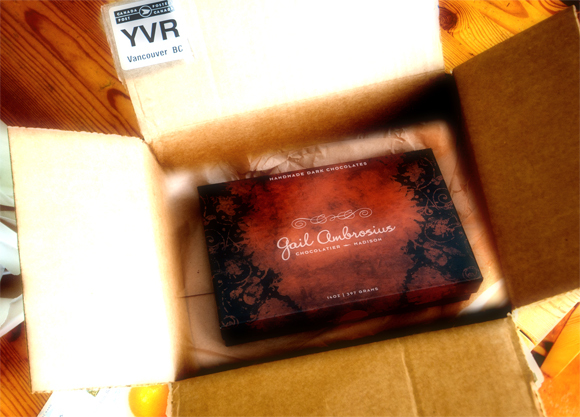 This scene is played out next, with a tiny, perfect box from Sibu, of Costa Rica. 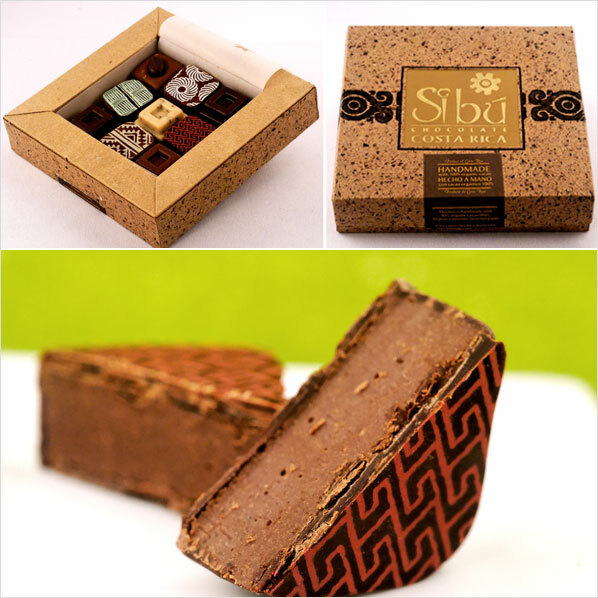 This box is crafted from the detritus of cacao pods, as Sibu is attempting, among other conscientious business practices, to greatly reduce their environmental footprint, in their packaging. The nine chocolates inside give me the impression of earthiness, and flavours of the land they come from. There are no neon colours here, but deep browns, muted red and green “paintings” on the tops of some, reminiscent of ochre and clay, and ancient art, and even the white chocolate is flecked with cacao nibs. I cannot wait to dive in, but I am denied these, as well, as they are relegated to the refrigerator, for the day. Torture. Beth Tully’s Cocoa Dolce box arrives, reveals some stunning pieces, including a tiny chocolate cup, holding a sugar encrusted crème brulee (my almost favourite dessert) and the boys and I have resorted to begging, wheedling, threatening, when, at last: the day of the photo shoot has arrived. With cotton gloves on my hands to protect the precious subjects, it is my happy job to bisect them, revealing their layers and fillings for the camera. Some are more amenable to this than others, and I probably jiggle the knife a bit, on purpose, in order to loosen a morsel or two. I find myself studying these chocolates in far more detail than I probably would have, a few months ago. As I have started down the path of learning about chocolate making, I realize how complex and intricate are the construction of some of these pieces. And the individuality of the different styles makes them impossible to compare. I sample very tiny pieces and find myself becoming overwhelmed by the diversity and intensity of flavours and textures. It’s a bit too much. The only way I can see to give each of them the attention their chocolates deserve, is to luxuriate in them, a box at a time, over the next week. A bit like, instead of having them all there at a party, and not having a chance for an in-depth visit, having each one over for dinner – and they supply the dessert. And, that is what I do. Except it doesn’t take a week. I find that a day with each box is sufficient to spend quality time with each piece. I keep each box on the kitchen counter, allowing it to mellow at room temperature, then “visit” it, each time I pass through the room, as a reward for completing a task. When the boys and their friends come home for lunch, I tell them seriously, that I am doing my homework. When they arrive home after school, I am proud to be able to report to them that I haven’t procrastinated – my homework is done … and three exquisite, empty boxes are there as proof. You can see some of the results of the photo shoot in the slide show below. Just click on any of the chocolate boxes to start the slideshow. You can return to the index by clicking the gallery button on the far left of the navigation bar.